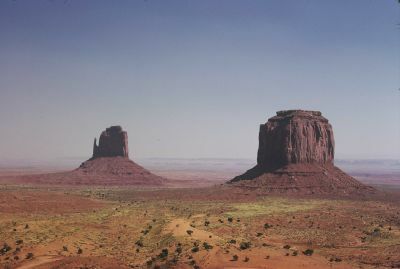 Monument Valley is located Arizona/Utah state border. The distinguishing geologic features are the large buttes and mesas that jut up from the valley floor. The sandstone formations can reach as high as 100 feet. The valley's vivid red color comes from iron oxide exposed in the weathered siltstone. The darker, blue-gray rocks in the valley get their color from manganese oxide.